Sanimatic is an electrically controlled rise and fall WC that brings the benefits of the stair lift to the downstairs cloakroom. The minimalist Sanimatic provides finger tip control, enabling the user to adjust the seat height up or down, and flush the WC without having to turn or stretch. Sanimatic is compatible with all wall hung toilet bowls so design choice is not limited. It blends unobtrusively with modern bathroom furniture, making it look like a regular wall hung toilet. Sanimatic can either be wall mounted or recessed into the wall. It has a height adjustability of 37cms (approx.14. 1/2 inches) from 380mm up to 750mm from floor level. 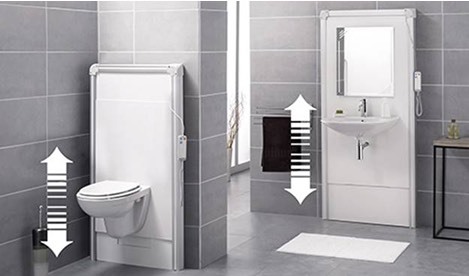 It's designed to carry a load of up to 150kg and the unit comes complete with a 6 litre cistern that can be flushed from the control handset. The use of anodised aluminium and white ABS ensure a clean and modern appearance. Subject to availability of water and electrical supply the unit can be installed in as little as two hours. The Sanimatic system can be used with optional folding arm supports and be either wall mounted or recessed into the wall. Sanimatic is complemented by the Sanimatic handwash basin which together with the optional mirror can also be moved up and down with a control handset.